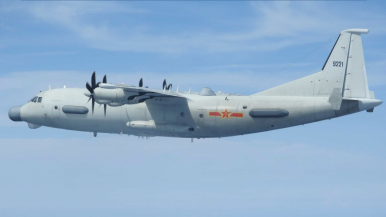 The Japan Air Self Defense Force (JASDF) scrambled fighter jets to intercept a People’s Liberation Army Navy Air Force (PLANAF) Shaanxi Y-9JB (GX-8) electronic warfare and surveillance aircraft traversing the Sea of Japan and East China Sea on July 27, the Japanese Ministry of Defense (MOD) said in a statement. According to the Japanese MoD, Japanese airspace was not violated. This appears to be the second time that the JASDF intercepted Shaanxi Y-9JB electronic warfare and surveillance aircraft. The last intercept of a Y-9JB took place in June, when the aircraft flew through international airspace between the Japanese islands of Okinawa and Miyako in the East China Sea. It was only in December 2017 that the PLA Air Force (PLAAF) declared the transport variant of the Y-9JB, the Y-9, a medium-range transport aircraft, operational and combat ready. Past Chinese patrols usually included Xian H-6K long-range bombers, Shaanxi Y-8 electronic countermeasures aircraft, or Tupolev Tu-154MD electronic intelligence aircraft, accompanied by J-11 or Sukhoi Su-35S fighter jets. For example, the PLAAF sent four Xian H-6K bombers, one Y-8 electronic countermeasures aircraft, one Tu-154MD electronic intelligence plane, and at least two Su-35 multirole fighters through the Miyako Strait in March of this year. In 2016, the JASDF has doubled the number of fighter jets dispatched for each intercept of foreign military aircraft approaching Japanese airspace from two to four. Overall, the JASDF scrambled fighter jets 904 times in response to unidentified aircraft approaching Japanese airspace during the last fiscal year that ended in March. Besides the June intercept of a Y-9JB, the JASDF last had to scramble its fighter jets in May to intercept two unidentified PLAAF fighter jets, four H-6K bombers, one Tu-154MD, and one Y-8 aircraft again passing through the Miyako Strait.